Mold Busters > Scholarship essays > Could You Be Suffering from Sick Building Syndrome? 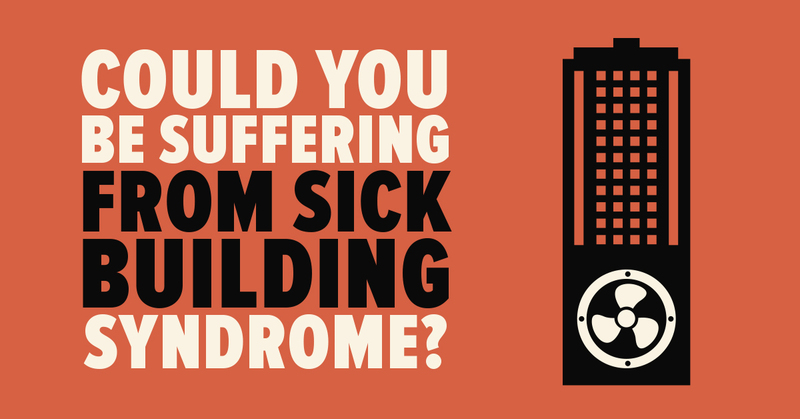 Could You Be Suffering from Sick Building Syndrome? Reports have shown that North Americans spend 90% of their time inside buildings (1). Based on this result, it is highly possible to deduce that a building’s biology can affect its occupants’ physiology (2). The sick building syndrome (SBS) is a common term used for several acute health symptoms observed amongst residents of a hazardous building that can be specifically associated with the time spent in that building (3-5). Therefore, in such cases, occupants report significant relief and improvement in their health soon after leaving the building. But how would an individual know whether they are suffering from such syndrome? sensitivity and overall health of every person can influence the severity of the downstream effects of SBS (12). Therefore, such syndromes can exacerbate other preexisting medical conditions. For instance, an individual with cardiovascular issues might acquire severe palpitations and edema as a result of SBS (3). Living in sick buildings can also generate complications during pregnancy and increase the risk of miscarriage in some cases (3). There are several specific diseases (such as alveolitis, bronchitis, organic dust toxic syndrome, asthma, the Humidifier fever, Pontiac fever, Legionnaire’s disease caused by Legionella pneumophila bacteria, Lung cancer) that can be attributed to specific microorganism contaminations of sick buildings (13,14). However, in the medical field, it is known that such symptoms are also common in many other diseases (5,15). Therefore, the diagnosis of this syndrome is challenging and requires a process of elimination. The elimination process will also be based on the duration of the syndrome and the changes in the patterns of expression. As mentioned usually SBS can be linked to the time spent in or away from a residence. While this syndrome can be diagnosed and partially treated by medication, diagnosing the etiology of such syndrome within the building by an inspection company allows one to either avoid or permanently resolve the issues within one’s body and the building (16). 1) Chemical contamination: There are various chemical compounds that can lead to minor or major SBS. The sources of these compounds include but are not limited to carcinogens such as asbestos (previously used for insulation in building’s structures, can lead to mesothelioma, asbestosis and severe pulmonary cancer), formaldehyde (leading to interstitial lung disease), volatile organic compounds, unvented heaters (severe ocular, pulmonary and general complications), pesticides (causing pesticide poisonings, damage to the nervous system and kidney) and etc. (17-19). Building materials (carpet glue, paint, and some fabrics) can also generate toxic fumes that may be harmful to the occupants. 2) Biological contamination: This category includes all microorganisms (virus, bacteria, protozoans, fungus, mold, mildew, pollen, etc.) that can spread in the air, survive and replicate in the water trapped within the pipes and the building’s structure (3,20,21). These microorganisms can cause severe allergic reactions which can lead to all or some of the complications mentioned above depending on the severity of the response of the immune system within the individual (3,14). Furthermore, insects or bird droppings can be sources of contaminations within buildings if not resolved or eradicated. 3) Improper air conditioning and inadequate ventilation: The humidity, ventilation and the temperature of the building should be designed such that there exists a balance between the maximal airflow and minimum wasted energy within the building (22). Buildings that meet only one or neither of these standards can potentially put the occupants at risk for SBS (3,23,24). It is also important to notice that improper ventilation can also result in the buildup of toxic gases (nitrogen dioxide, carbon dioxide, and carbon monoxide) combusted from the heating systems (22,25). 4) Radiations: Although several household products have radiation pollutions (computer, microwave, etc. ), the improper wiring within a household can lead to excessive radiation that can put exposed individuals at risk for cancer. 5) Lighting and acoustic contaminations: improper lighting and sound pollution within the household can not only result in ocular and auditory irritations but can also affect the psychology, the productivity and the personality of the occupants (3). These etiological factors are known to be causing SBS. While the SBS patient can benefit from some antidepressant or immune response suppressors in tolerating and combating some of the symptoms, they may reoccur after the patient stops consuming these drugs. A better approach to such disease is to either permanently leave the building or eliminate the sources of contaminations. In order to diagnose and fix such contaminants in a building, an expert inspector company is required. Such company will perform thorough inspections of the air quality, temperature, airflow, possible contaminant as well as the material used within the building’s infrastructure to diagnose the primary cause(s) of building’s sickness. It is important to mention that although the diagnosis of such factors can help in resolving the issues of the buildings, the preventative measures are even more significant. Because they can reduce the future financial burdens caused by the spreading of contamination within the building and the potential health issues and the prolonged recovery time of the current and future occupants of the building. Considering regular building check-ups such as air quality monitoring and asbestos testing as well as ventilation, odor, insulation, moisture and mold inspections within the building are also essential. Eventual removal of the pollutant or contaminant and eventual repair of the building upon initial diagnosis can save the occupants from SBS and all of the irreversible damages that may occur, in some cases, due to prolongation of the syndrome. Last but not least, once the building’s issues have been resolved, management and maintenance of the building are required (26). Education about building’s standards and recognition of the seriousness of building sickness is the next step in preventing SBS. Ultimately, the knowledge about building’s inspection companies and their resources to strategize the maintenance procedures for the building can go a long way towards preventing future threats to the building or the occupants (27). (1) U.S. Environmental Protection Agency. Report to Congress on indoor air quality. EPA. (3) Joshi SM. The sick building syndrome. Indian J Occup Environ Med 2008 Aug;12(2):61-64. 1987(Building Use Studies Ltd, London.). Med J (Clin Res Ed) 1984 Dec 8;289(6458):1573-1575. (7) Burge PS. Sick building syndrome. Occup Environ Med 2004 Feb;61(2):185-190. Reports and Studies 1978(World Health Organisation, Copenhagen.). (9) Potter IN. The Sick Building Syndrome-symptoms, risks factors and practical design guide. (10) Seltzer JM. Building-related illnesses. J Allergy Clin Immunol 1994 Aug;94(2 Pt 2):351-361.
manifestations of sick building syndrome. Clin Ophthalmol 2017 Mar 14;11:517-522.
Review of the Literature and Suggested Diagnostic Criteria. Front Immunol 2017 Aug 10;8:951. Epidemiology (JPC-SE) approved June 4, 2012. (18) Baccioglu A, Kalpaklioglu AF. An unusual form of formaldehyde-induced lung disease. Allergol Immunopathol (Madr) 2007 May-Jun;35(3):110-112. Immunol 1994 Aug;94(2 Pt 2):296-303. Res Public Health 2015 Nov 18;12(11):14709-14722. Public Health 2015 May 27;12(6):5833-5845.
study. Int Arch Occup Environ Health 2008 Oct;82(1):21-30. (26) Leaman A. Syndrome symptoms. Building 1989;22(2):6.
of buildings. Int J Environ Health Res 2017 Oct;27(5):427-439.